For several years at Vancity, from the time I was accountable for digital services and started working on initiatives to engage and strengthen community, I’ve been talking about illuminating the network. The more I learned about co-operatives, the more this idea grew. As a financial co-operative, Vancity has a great opportunity to continue to connect our members with each other, with our business members (businesses and organizations who rely on Vancity for their financial services and advice) and business members with each other. Lots of opportunity. Recently, a project I’ve been working on for the past few months with some brilliant and capable colleagues launched as a test and learn pilot in Victoria, BC. The project is called Localty, because what else are you gonna name a loyalty program focused on local purchasing? Localty is a mobile web platform connecting our members and the public to discover Vancity business members, and encourage them to promote these local businesses via social media and to shop locally. We want to encourage more people to steer some of their purchases away from multi-national chains and big box stores to small, local businesses. Studies show that when people shop locally, there is a multiplier effect for that community, where more of their money stays local and stimulates local job growth and has positive outcomes for the environment and local infrastructure. I am excited about Localty because it is a pilot that could create significant local investments by our members into their local economies. I am also encouraged by the way we created the program. The small team worked on it for three months, and are piloting something that shows potential but is by no means fully baked. The version we launched isn’t a full app, but a mobile website, so we could get something delivered quickly to start learning what works and where we misjudged our assumptions. We added gamification elements, where people unlock badges and earn entries into winning coupons to spend at any participating local businesses. This way, we will quickly learn what it will take to shift people’s behaviours to spend more of their money at local stores and services. Eventually what we learn could influence other loyalty and rewards programs we currently have or are considering. Using your new @Vancity Localty App? Don't forget to drop in at the @RoyalBCMuseum. If we’re successful, what better way is there to bring our values-based banking model to life and show off our co-operative network, while adding real value to our business members, the general community and back to Vancity. I see this as an amazing win-win-win. 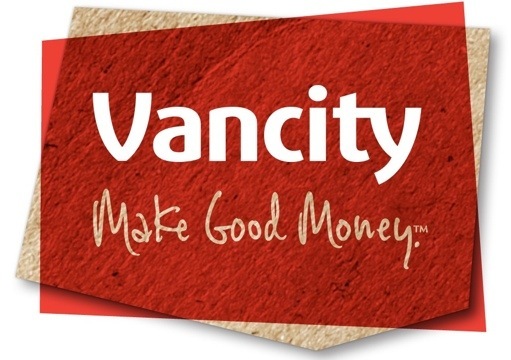 Two new Vancity commercials began airing this month. Both get to the heart of our new Good Money brand platform, which connects the dots between the business our members do at Vancity and the work Vancity does to support the communities where we operate. I am tremendously honoured to be the voice in both of these commercials (although there is another voice at the end). All the people in the spots are our real members or staff. Wasserman + Partners is hiring. Vancity’s agency, Wasserman + Partners is hiring for two positions. The first is a Digital Project Manager who will be “responsible for the successful planning, managing and launching of digital projects within the advertising agency”. The other is the Director of Production, a role to “bring campaign concepts to life, regardless of the medium, or whether it has ever been done before”. Both roles are chances to work with this excellent Vancouver agency, which Vancity chose as their agency of record earlier this year in a unanimous decision.